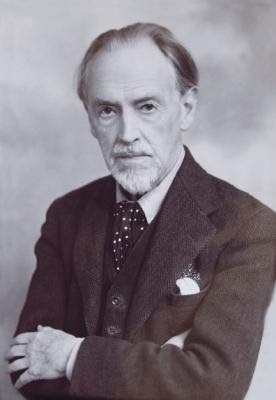 The English composer Cyril Scott (1879-1970) wrote a book called Music: Its Secret Influence Throughout the Ages in which he set out his belief that, rather than contemporary consciousness determining the kind of music that was produced, it was the kind of music certain composers produced that largely influenced human consciousness. He took examples from the great composers such as Handel, Beethoven, Chopin, Wagner and Debussy, and tried to show that the new kinds of music they wrote were responsible for reorientating our thoughts and emotions in new directions. For example, Handel's Biblical oratorios helped create the Victorian Age with its formality, reverence and love of ceremony. Bach's music encouraged the intellectual approach, especially in Germany where it became popular after Mendelssohn's rediscovery of it. Beethoven's passionate outpourings inspired sympathy and allowed the human heart to express emotion far more extensively than hitherto, even leading, so Scott says, to the advent of psychoanalysis. As for Chopin, he helped create a more developed sense of refinement and promoted (not intentionally but by virtue of his music's poetic sensibility) the idea of female emancipation, while Wagner, Debussy and Richard Strauss (among others) all contributed to the evolution of consciousness in various ways. These were just the major composers but others who ploughed a similar course to the greats all aided in the work of the development of human ways of thinking and feeling. This theory is in line with ancient Greek thought, particularly Plato who wrote in the Republic that "the introduction of a new kind of music must be shunned as imperiling the whole state". While Aristotle wrote that "music has the power to form character, and the various kinds of music based on the various modes may be distinguished by their effects on character." Scott had several strings to his bow. He was at one time a highly regarded composer, but he also wrote books on various subjects and even a bit of poetry*. He was a Theosophist and his book on music is written from that angle. Indeed, he makes no bones about the fact that the information in it came from esoteric sources, namely one of the Theosophical Masters with whom he communicated through a medium. When I first read this book many years ago I took him at his word but it's since become clear that he was not entirely truthful in certain matters, and that the books for which he is now best known, the Initiate trilogy, though presented as factual, are largely fictitious though probably based on facts of some kind. There is also a book called 'The Boy Who Saw True' which purports to be the diary of a clairvoyant Victorian boy in touch with a Master that mysteriously fell into Scott's hands, but which is obviously a concoction based on Scott's own childhood experiences filled out with Theosophical references and accounts of psychic happenings. I don't think Scott was trying to deceive in any way but he was a creative artist and perhaps used fiction to get across fact thinking that this approach would reach a wider audience. I disagree with him, especially concerning spiritual matters with regard to which I think one must be entirely truthful. The end does not justify the means. But I do believe that Scott had encounters with spiritual beings and tried to represent these in a way that would convince others of their existence; such, he would have thought, being the need of the hour. Anyway, back to the book about music. I think that Scott's thesis, that music affects and to some extent even determines character and morals, is a sound one though I might extend it to include all the arts, notwithstanding the fact that music is by some distance the most powerful of all art forms and the one that can affect us most profoundly on a subliminal level. To those who would query how classical music which, before the advent of recording techniques, would not have been heard by a majority of the population, can affect a whole society, Scott points out that it would have been heard by those who set the tone of society and that's all that is required. Scott states that one of the aims of those who attempt to guide human evolution into higher forms of awareness is to bring us to an understanding of the deva world. Roughly speaking, devas, a Sanskrit word (cf. the Latin deus) borrowed by Theosophists, correspond to our idea of angels. 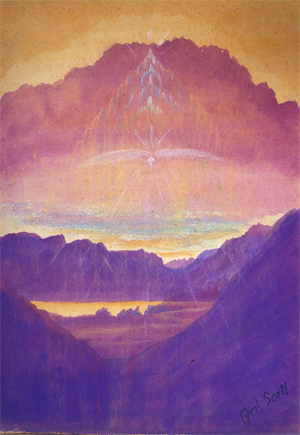 In the Theosophical scheme, these are a separate order of creation that range from nature spirits right up to Cherubim and Seraphim. You might say that they run the universe on God's behalf. Musicians such as Grieg, Debussy, Delius and Scriabin (according to Scott) attempted to express, albeit unconsciously, something of the nature of these beings from the Nordic nature spirit music of Grieg through Debussy and culminating in Scriabin whom Scott (writing in 1958) called the greatest exponent of deva music born so far whose music in Prometheus "reaches a climax expressive of unutterable grandeur but... it is the grandeur of mighty Beings, flashing forth Their unimaginable colours, and filling the vast expanses with Their song." I hadn't heard of Scriabin when I first read the book and naturally after that I rushed off to buy a recording of Prometheus. I have to confess that I preferred the Chopinesque first piano concerto on side 1 of the LP (this was the end of the '70s) to the cosmic eruption of the main work but I've got more used to it since though I still can't feel it lives up to Scott's description. Perhaps it's a case of Scriabin's reach exceeding his grasp, for me anyway. Scott makes no bones about his dislike of jazz which he says "was definitely 'put through' by the Dark Forces", and led to "a very marked decline in sexual morals." I don't see how one can dispute this and the only question is whether there was an attempt to make the best of a bad job and inspire some musicians to create good music in the context of a decadent form. The same applies to rock 'n' roll which Scott calls "the latest cumulative effect of jazz", going on to write that these have had "such vulgarizing effects, that we now have the misfortune to live in a vulgar and blatant age." I remind you that he was writing in 1958. What would he think now! He is probably right in his basic analysis of these forms of modern music but I can't write them all off. Speaking as someone who grew up in the '60s and '70s, I still enjoy a lot of the music of that era while recognising that some of it (and much more since as popular music has become increasingly corrupt and is often now actively evil in its effects) does correspond to Scott's description. But the music of someone like Brian Wilson of the Beach Boys has surely done nothing but good. Scott's criticisms, by the way, do not apply to folk music and its derivatives. He can't just be dismissed as a musical snob. One can argue about the detail's of Scott's thesis but I think he is right in its general thrust. The great composers have been sent by heavenly powers to provide beauty and healing succour to humanity, yes, but also to instigate changes in consciousness. But as we have just seen, what good can do, evil can as well and the era of great composers, or geniuses as one must call them, seems to have come to an end, at least temporarily. But it's still worth bearing in mind the powerful effects of music and try to use it in our own environment in the best way we can. Taken right back to the bone, music is sound and it is commonly thought in spiritual teachings that sound created the universe. It still does in many ways, great and small. * I didn't realise that he painted too. There are a selection of his watercolours on the website devoted to him (run by his granddaughter) and I think they are rather good. A very talented man. @William - Interesting post, on an important theme. I would add (I'm sure you'd agree) that there is also a necessary development in the masses reception of (for example) music. For example, in my pre-Christian, pre-spiritual days I much liked the music of Brian WIlson (at least, I liked the Beach Boys) - but what I personally took from it was not really 'good' - a yearning for a hedonistic, 'surfer' lifestyle, undercut by a rather despair-inducing sense of transience and loss... As a spiritual young man, I expect that you took something quite different and better from the music. My point is that - on its own - music can't really influence (for better or worse) people beyond their capacity, or in a direction, that is opposed by their basic assumptions. This can be seen in modern professional classical musicians, singers (including composers and critics), who are *mostly* (there are some outstanding exceptions) some of the shallowest/ most superficial, materialistic and inane people I have ever encountered! I is hard to believe that they spend so much of their lives playing, experiencing, writing-about such sublime art - yet they apparently gain *nothing* from the experience! I would imagine that classical musicians are often just doing a job and that beats any actual musical appreciation right out of them. I mean, how many times can you play the same piece of music without completely losing interest in it, and when you add rehearsals into that it's enough to kill any love of the music for itself. Scott isn't saying that listening to good music makes us better people but that the type of music a society concerns itself with has an effect on its intellectual and emotional life. But it's not a simple thing. After all, it's often been observed that concentration camp guards gassed their prisoners and then went off to listen to Schubert or whatever. I'm not going to forget the idea of you yearning for a surfer lifestyle in a hurry! I can't say I was immune myself - in my younger days, I hasten to add.